Danny O'Brien is not willing to take on star colt Sepoy with Adamantium in the Coolmore Stud Stakes despite his easy win at Caulfield yesterday. The Elusive City colt has raced five times and hasn't finished out of a place, winning both his starts at Caulfield including yesterday's Carlton Draught Racing Sweep Hcp (1200m). O'Brien said he was sure there were better races in the three-year-old but the options were limited for him over the spring. "You could run him in the Coolmore but you're running for second place in the Coolmore," the Flemington trainer said, referring to Manikato Stakes winner Sepoy's dominance. 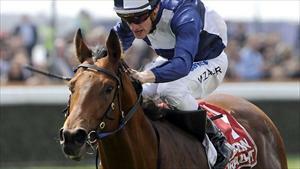 "If he pulls up well we might pop straight to the mile (1600m) in the Carbine Club Stakes, but that would be a big ask. "He will get out to a bit further. He could get out to 1400 metres or a mile. His mother's a half-sister to the dam of Sky Cuddle (Group One Emirates Stakes winner). "He was bred by Hilton Mackley in New Zealand and he has actually stayed in the horse. He was a beautiful yearling and obviously if you look at him now he's a lovely style of colt. "We'll just see how he does. He might even have had enough for this spring so we might give him a break and have a look at the autumn with him." Backed from $4 and sent out $3.70 favourite, Adamantium ran on strongly from fourth of the six runners to score by 1-3/4 lengths from Whitlam ($4) with race leader American Dream ($3.80) a long neck away third. The colt was well ridden by Mark Zahra who won the race two years ago aboard King Pulse who was beaten a nose by Headway in the Group One Coolmore Stud Stakes (1200m) at Flemington on Derby Day at his next start. "It's always a springboard for up-and-coming horses and he's right on that mark. He won really well with his ears pricked and he's only going to improve," Zahra said.